These days Warren Buffett is enjoying incredibly low rates at which his firm is able to finance itself. In fact the rates are unprecedented. LCD News: - Berkshire Hathaway Finance placed its second deal of the year today – both of which targeted the repayment or replacement of imminent or recently matured debt issues – in a $1.6 billion, three-part sale that came in substantially below borrowing costs for similar maturities in January. The company placed 1.60% notes due 2017 at T+85, following a January sale of 1.9% notes due 2017 at T+100, and 3% notes due 2022 at T+125, versus T+137.5 for 3.4% notes due 2022 in January. The investment manager also placed 4.4% notes due 2042 at T+145, rounding out a sale that saw all three tranches placed at the narrow end of guidance. Five-year notes at 1.6%! That's even lower than U.S. Bancorp's dirt cheap financing discussed earlier. The market is now viewing Berkshire Hathaway as an equivalent of or better than a strong bank. It's amazing that Buffett was able to combine an insurance business with a large investment fund to create a credit strong enough to compete for financing with top banks. In some ways Berkshire Hathaway is now thought of as an unregulated merchant bank that provides financing to other banks in need - from Salomon Brothers to Goldman to BofA. Some have speculated that JPMorgan could be next, given Buffett's cheap source of debt funding and depressed JPM shares. On the other hand as JPMorgan deals with its recent problems, its credit risk profile - as viewed by the market - has markedly worsened and CDS spreads have spiked. 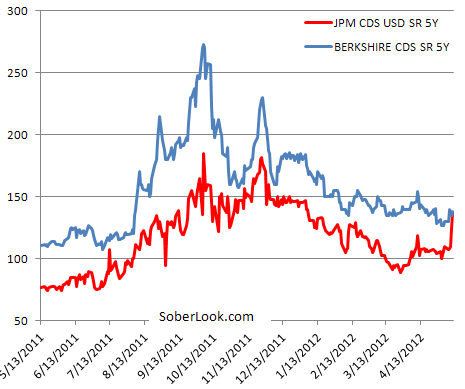 And for the first time since 2008, JPMorgan's 5-year CDS spread has converged with Berkshire Hathaway's 5-year CDS. The market now views Buffett's insurance firm combined with an investment fund as having the same credit risk as JPMorgan. To put it another way, the market views JPMorgan's credit risk as that of a large investment fund combined with a lending business.